Hereunder are 6 steps helping you plan a trip to Beijing, especially useful for the first-time travelers. Following this advice, you can have a smoother trip and learn more about the ancient city. You can enjoy different sceneries of the city in different seasons, but the best time to travel is from September to October in autumn. The weather is appropriate and the temperature is moderate. If you don't have time in autumn, then you should not miss the early summer. From May to June, you can appreciate the city before the hot days come. See More about: Beijing Weather and Best Time to Visit. 3 to 5 days are necessary to have a worthwhile tour for most people. Avoid the public holidays and various festivals, especially the Golden Week of National Day holiday from October 1st to 7th. See More about Public Holidays in China. Look for the flight tickets made available three months in advance, as you will have an opportunity to book some cheaper flights. Book round trip tickets as soon as possible once your travel date is settled. After buying the flight tickets, you can start to book hotels. Generally, on normal days, the hotels in Beijing are not difficult to book and 10 days in advance is enough. However, if your visa formalities require some hotel booking certificates, or you will travel on holidays, then we suggest you book the hotel as early as possible. Most of the tourists prefer to live in the city center, near the Tiananmen Square, Forbidden City and Wangfujing Street. Some old Hutong areas like Houhai, Drum Tower, Qianmen Street, and Dashilar are also popular places to stay. See More about Where to Stay in Beijing. Study the China visa policy carefully. If you need a visa, you are recommended to apply and submit the documents one or two months in advance. If you are eligible for the 144-hour visa-free transit in Beijing, you do not need a visa. For the Steps 2, 3 and 4 above, if you book a guided tour, some steps can be arranged by your travel agency according to the service included in your tour. This step is very important if you are an independent traveler or tend to a semi-self-guided tour. 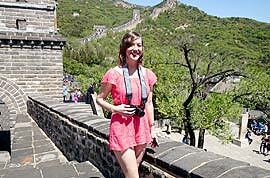 You need to know what to see in Beijing and make a general tour plan. 1. Climb the Great Wall, a huge series of ancient fortifications which known as one of the Seven World Wonders; Badaling and Mutianyu are popular sections. 2. Explore the Forbidden City, the world's most complete and largest complex of ancient wooden structures, once serving as the imperial palace of Ming and Qing Dynasties (1368 - 1911). 3. Taste Beijing Roast Duck, a famous and popular local dish. 4. Watch Kung Fu Performance, which is a cultural symbol of China and an indispensable night activity in a Beijing tour plan. 4. Clothes and accessories: check the weather forecast a week before to prepare proper clothing. 5. Toiletries and makeup bag. See More about China Travel Checklist. When the above 6 steps of your Beijing tour plan are complete, you can set your mind at rest and just wait for the departure. 3. Bring extra photos and copies of important documents for emergency use. 4. Book flight or high speed train tickets as early as possible if you have tour plans from Beijing to other cities. For a visit to Beijing mid June, what type of mask should I bring for air issues? Well, the air quality in June won't be that serious. Thus you can just prepare the ordinary mask. What is the best way to get to regent hotel, If I am landing at PEK at 3:30PM on a Friday? There will be three of us with luggage. You can take airport express to Sanyuanqiao Station. Then take metro line 10 to Huixin Xijie Nakou Station and transfer to metro line 5 to Dengshikou Station, Exit C. Afterwards, walk southeast around 300 meters to find the hotel.